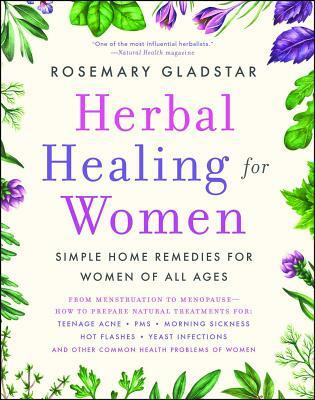 Simple, safe, and effective herbal remedies for women of all ages. For centuries women have turned to herbs to cope with a wide variety of health problems and conditions. Comprehensive and easy-to-use, Herbal Healing for Women explains how to create remedies—including teas, tinctures, salves, and ointments—for the common disorders that arise in the different cycles of a woman's life. -an alphabetical listing of herbs, including a brief description of the herb, the general medicinal usage, and when necessary, warnings about potential side effects. By explaining the properties of specific herbs and the art of preparation, Rosemary Gladstar demonstrates not only how to achieve healing through herbs but good health as well. Rosemary Gladstar has taught herbology extensively throughout the United States and has led herbal travel adventures worldwide. Her experience includes 20 years in the herbal community as a healer, teacher, visionary, and organizer of herbal events. Currently, she runs Sage Mountain in East Barre, Vermont, where she teaches and sponsors workshops and sells herbal preparations. Rosemary lives in East Barre, VT.
Dr. Earl Mindell author of Earl Mindell's Herb Bible The most complete women's herbal guide I have ever read.